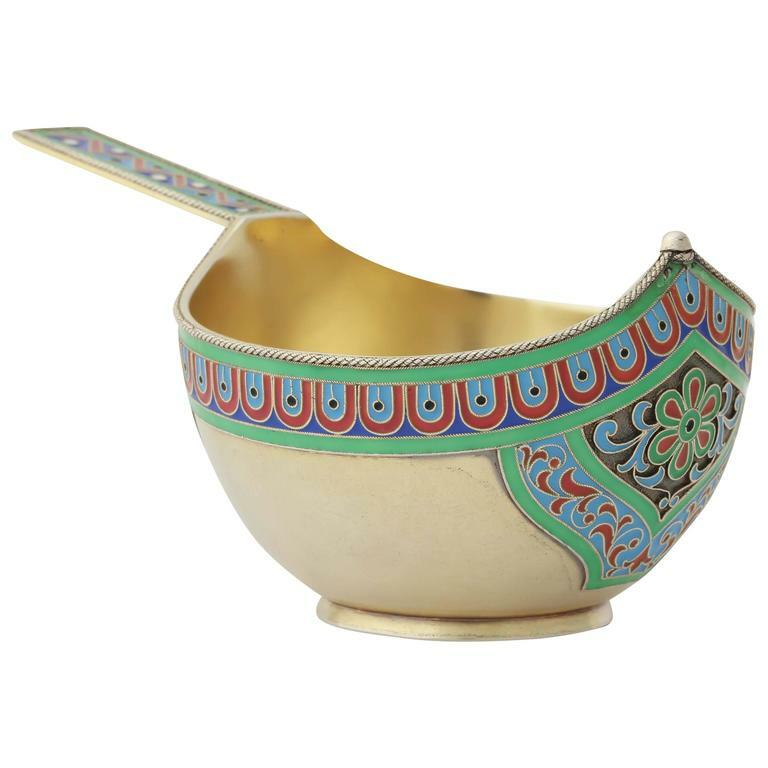 The exterior of the oval bowl and handle decorated with vibrant enamel colors in distinctive Old Russian entrelac design unique to Grachev of St. Petersburg. The base is set with a Russian silver Ruble of Nicholas II dated 1901. By the Gratchev Brothers, St. Petersburg, 1899-1908, stamped with the Imperial Warrant above Brothers Gratchev in Cyrillic and a kokoshnik with assaymaster’s Cyrillic initials for Yakov Lyapunov. 4 ½ in. (12 cm) long; 2 ¾ in. (7.2 cm) diam. As principal suppliers to the Imperial Court of Tsars Alexander III and Nicholas II, Gratchev was one of the few St Petersburg firms to specialize Old Russian style enamels as opposed to Moscow.